If the button is blue, then click it to turn grey. 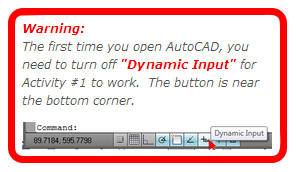 then choose "Save as..." and save the file as "Activity-2.dwg"
With Activity #2, we will be using "Relative Coordinates". Check this chart to see the differences between "Absolute Coordinates" and "Relative Coordinates". Means: Make a point at X=30, Y=40. Means: From the starting point (20,15); make a new point over 30 and up 40. Wow! That's really different. But Relative Coordinates are great when we don't care where we are on the drawing, but we know the X and Y distances from the last point. In your folder called "AutoCAD". 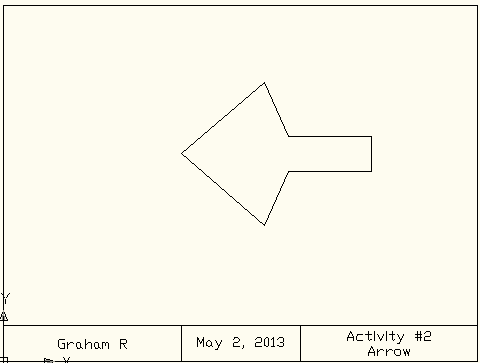 Save this drawing as "Activity-2.dwg". Credits: These activities were created by David Haney and/or created/modified by Brian Wilkins before being modified by Graham Rich. Many thanks to both David and Brian for sharing this work with us!